Tuesday, April 3rd, 2018 -- ASA Exports is a weekly feature (drops every Tuesday) in which we track all former Arizona Soccer Association players who are currently playing in professional leagues throughout the world. Greg Vanney, Toronto FC - Toronto FC defeated Real Salt Lake 3-1 on Friday. Justen Glad, D, Real Salt Lake - Started and played 90 minutes in RSL's 3-1 loss to Toronto FC on Friday. Brooks Lennon, F, Real Salt Lake - Started and played 90 minutes in RSL's 3-1 loss to Toronto FC on Friday. Jose Hernandez, M, Real Salt Lake - Not in the 18 for RSL's 3-1 loss to Toronto FC on Friday. Donny Toia, D, Orlando City - Not in the 18 for Orlando's 4-2 win over NYRB on Saturday. Alan Gordon, F, Chicago Fire - Was a 75th minute substitute in Chicago's' 2-2 draw with Portland on Saturday. Luis Robles, GK, New York Red Bulls - Started, played 90 minutes and made four saves in NYRB's 4-3 loss to Orlando on Saturday. Nick DeLeon, D, D.C. United - Started and played 90 minutes in D.C's 1-0 loss to SKC on Saturday. Brad Evans, D/M, Sporting Kansas City - Not in the 18 for SKC's 1-0 win over D.C. on Saturday. George Malki, M, Houston Dynamo - Not in the 18 for Houston's 2-0 loss to New England on Saturday. Matt Bersano, GK, San Jose Earthquakes - In the 18 but did not play in San Jose's 2-1 loss to NYCFC on Saturday. Niki Jackson, F, Colorado Rapids - In the 18 but did not play in Colorado's 3-0 win over Philadelphia on Saturday. Grant Lillard, D, Chicago Fire - In the 18 but did not play in Chicago's 2-2 draw with Portland on Saturday. Julie Ertz, D/M, Chicago Red Stars - Not in the 18 for Chicago's 3-2 loss to Portland on Saturday. Cali Farquharson, F, Washington Spirit - Not in the 18 for Washington's 2-0 win over Orlando on Saturday. 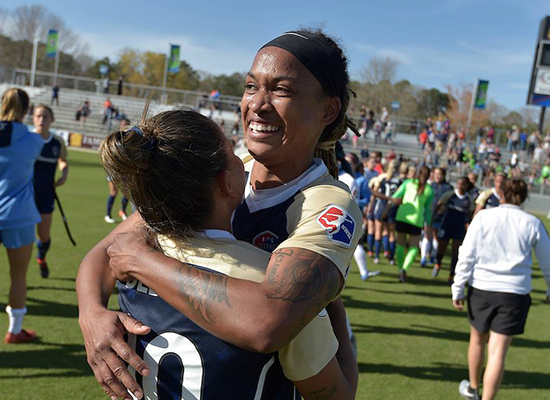 Jessica McDonald, F, NC Courage - Was a 55th minute substitute and SCORED A GOAL in NC Courage's 1-0 win over Sky Blue on Saturday. Ashley Hatch, F, Washington Spirit - Started, played 90 minutes and SCORED A GOAL in Washington's 2-0 win over Orlando on Saturday. Sydney Leroux, F, Orlando Pride - Started and played 90 minutes in Orlando's 2-0 loss to Washington on Saturday. Evan Waldrep, M, Phoenix Rising - Was a 67th minute substitute in Phoenix Rising's 1-0 win over Reno on Saturday. Justin Davis, D, Nashville SC - Started and played 90 minutes in Nashville's 1-0 win over Bethlehem Steel on Saturday. Sam Gleadle, F, Reno 1868 - Not in the 18 for Reno's 1-0 loss to Phoenix Rising on Saturday. Ventura Alvarado, D, Necaxa - Started and played 90 minutes in Nacaxa's 1-1 draw with Pumas on Saturday. Cassie Miller, GK, PSV Eindhoven - Started and played 90 minutes in PSV's 4-1 win over Heerenveen on Tuesday. Arianna Romero, D, Vålerenga Fotball Damer - Wednesday match against Lyn was postponed.